Johnson Chesnutt Whittaker was the second black cadet at the United States Military Academy at West Point in New York. He was born in South Carolina to an enslaved mother, Maria J. Whitaker, and her free husband, James Whitaker, in 1858. (Later in life, he added a second “t” to his name.) By October 1869, Whitaker attended a freedmen’s school in Camden, where he received lessons for five years. In the fall of 1874 he became one of the first African American students to enter the University of South Carolina. Whittaker was an exceptional student, academically ahead of most of his classmates; he averaged 94 percent in all his courses at the University. After befriending Richard T. Greener, his professor, Whitaker was nominated to attend West Point. He arrived there on his birthday, August 23, 1876. Whittaker shared his room with the first black cadet, Henry O. Flipper, who was a few years his senior. Despite his stellar record at the University of South Carolina, Whittaker’s academic performance at West Point was average. Moreover, he had learned from Flipper to adjust to the physical harassment from white cadets by turning the other cheek. With Flipper’s graduation, by June 1877, Whittaker was the only black cadet in the academy. One year later, Whittaker ran into academic difficulties; he failed an examination and was close to a dismissal. However, his main problems stemmed not from his academic setbacks, but rather his forced solitude. None of the other cadets spoke to him either in class or in non-academic settings during the years he attended West Point. On the morning of April 6, 1880, an officer found Whittaker unconscious and bound to his bed suffering from slashed earlobes. His hair was cut in several places. West Point Commandant General John M. Schofield immediately investigated the incident and concluded that Whittaker had inflicted these injuries upon himself and then tied his legs to the bed. Following his brief investigation the commandant added that it was unreasonable to expect blacks to compete successfully with whites and that it was a mistake to make them try. He urged that the doors of West Point be closed permanently to non-white youth. Whittaker, shocked at the summary decision, claimed that three masked attackers were responsible for his injuries and immediately requested a court of inquiry. The court met from April to June 1880. The case received front page coverage in major newspapers while Congress debated the incident. 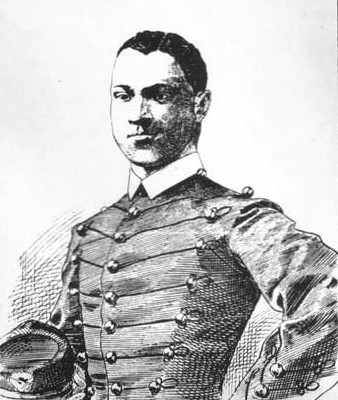 The court of inquiry upheld Commandant Schofield’s findings but added that there was extensive prejudice at West Point toward Whittaker because of his race. President Rutherford B. Hayes removed Schofield from his post and replaced him with former Freedman’s Bureau head Oliver O. Howard. Commandant Howard ordered a full court martial to determine what actually happened. He granted Whittaker a leave of absence to prepare his case. Whittaker’s defense was handled by former South Carolina Governor Daniel Chamberlain and by Richard T. Greener, Whittaker’s former university professor. The army’s case was presented by Asa Bird Gardiner, the foremost army trial lawyer of the era. The president of the court martial was General Nelson A. Miles while the head of the army, General William T. Sherman, closely followed the proceedings which began in June 1881. Whittaker was again found guilty. However, Secretary of War Robert Todd Lincoln declared the court martial invalid, a decision ratified by President Chester A. Arthur on March 22, 1882. On the same day (March 22) Lincoln ordered Whittaker dismissed from the academy because he failed an examination in June 1880. After leaving West Point, Whittaker went on a brief speaking tour to discuss his experience. Then he became a teacher at Avery Institute in Charleston, South Carolina. After studying law, Whittaker was admitted to the South Carolina bar on May 26, 1885 and began practicing in Sumter. He married Page E. Harrison, and the couple had two sons. Whittaker found legal work difficult to obtain. He returned to teaching school in 1890 and soon became principal of the first black public school in Sumter. In 1900 he briefly worked for the U.S. Census Bureau. From 1900 to 1908 he was principal of the Colored Normal Industrial, Agricultural and Mechanical College (which later became South Carolina State University). From 1908 to 1925 Whittaker was a teacher, assistant principal and finally principal of Douglass High School in Oklahoma City, Oklahoma. The writer, Ralph Ellison, was one of his most famous students. After his speaking tour, Johnson Chestnut Whittaker never publicly commented about his time at West Point and lived out the rest of his life as stoically as he lived in West Point. On January 14, 1931, Whittaker passed away, less than a week from the fiftieth anniversary of the beginning of his court martial. He was buried in a black-only cemetery in Orangeburg, South Carolina. Robert Ewell Greene, Black Defenders of America, 1775-1973 (Johnson Publishing Company Inc. Chicago: 1974); John F. Marszalek, Jr., Court Martial: A Black Man in America (New York: Scribner, 1972).